A basic understanding of Vue.js and Node.js are needed to follow this tutorial. As developers, deploying applications and websites can be a pain point at times and we generally tend to prefer solutions that are easy and scalable. Hosting solutions that require SSHing and having to make configurations and a million things to do before deploying can (and will) get tedious after a while. This is where Firebase Hosting comes in. We’ll build a static website and deploy it to the web using Firebase Hosting. We are going to build a realtime multiplayer trivia game, the game is going to work like the popular multiplayer game QuizUp. Here’s how the game is going to work. The questions are going to be gotten from the lyrics from Hamilton: An American Musical and users have to answer correctly the name of the character in the musical who sang that line. The game tests the user’s knowledge of Hamilton and users can play for as long as they like. See a demo below. Our game will be built with Vue.js and will use Pusher’s Client Events and Presence Channels to make sure a user’s move is shown realtime. Pusher’s Presence channels expose the additional feature of an awareness of who is subscribed to that channel. This gives developers the ability to build features like chat rooms, collaborators on a document and multiplayer games. All Presence Channels must be subscribed with the prefix of presence- and as with private channels a HTTP Request is made to a configurable authentication URL to determine if the current user has permissions to access the channel. Client events are simply a way in which events can be triggered directly from the client-side as opposed to triggering from the backend server. Client Events are used in instances where some actions may not need validation or persistence and can go directly via the socket to all the other clients connected to the channel. In our case, we use the Client Events to update a user on the current score of the other user playing the game. Client events must be enabled for the application. You can do this in the Settings tab for your app within the Pusher dashboard. Client events can only be triggered on private and presence channels because they require authentication. Client events must be prefixed by client-. Events with any other prefix will be rejected by the Pusher server, as will events sent to channels to which the client is not subscribed. You can read more on Client Events by going through the documentation. Log in to your dashboard (or create a free account if you don’t already have one) and create a new app. Copy your app_id, key, secret and cluster and store them somewhere as we’ll be needing them later. One more thing. In your dashboard, navigate to the App Settings tab and make sure the Enable Client Events checkbox is checked. This lets clients communicate directly with each other. This creates a Vue.js app inside the a folder titled hamiltonlyrics. Navigate into the folder and run the command npm run dev to see the Vue.js application. As explained above, Client Events require authentication to make sure a user is subscribed to the channel. Therefore, we are going to create a Node.js server so that Client Events can have an authentication route. Let’s install the modules we’ll need for the Node.js server. // The code below helps to fix any potential CORS issue. In the code block above, Pusher is initialized with the dashboard credentials. The /pusher/auth route is also created. Now we can simply run node server.js and the Node.js app should be up and running. Before we go on let’s add the command above to the existing scripts object in the package.json file so we don’t have to type in the command every time. Open up the package.json file and edit the dev line inside the scripts object with the one below. "dev": "nodemon server.js & node build/dev-server.js"
Let’s get started on building the game. We’ll be working with two files throughout the course of this tutorial, a Home.vue file and a ChannelDetails.vue file. If you use ESLint, you should be getting a warning that the Pusher JS library has not been installed. That can be installed by running this command npm i pusher-js. So what’s happening up there? Firstly, Pusher is imported and a connection is established using credentials like APP_KEY, and CLUSTER. An authEndpoint is added to the Pusher instance. The authEndpoint is the endpoint Pusher uses to authenticate users. Secondly, there are two functions above which are being exported. The first function getPresenceID() checks the address bar of the browser for URL parameters and then appends presence to the result. This is done so that the channel name will always have a prefix of presence- since we are using Presence channels. The second function uses the result of the getPresenceID() function and uses it to subscribe to a channel (a Presence Channel to be specific). In the code block above, we set up the foundation for the game and how it’s going to work. Inside the <style> tag and inside the <script> tag, there are a couple of functions that we will need to create and add logic to. Let’s take a look at the functions we need to create. This function is called inside the created hook and that means it will always be called whenever the instance has been created. Let’s write the code for this function. // Sets the data instance url variable to the current URL. // The channel variable is set to to the subscribeToPusher function in ChannelDetails. // The pusher:member_added event is triggered when a user joins a channel. We increase the number of players by one and also set the secondplayer boolean to true. // Once a subscription has been made to a presence channel, an event is triggered with a members iterator. // This checks if there's a player online already and sets the new player as player two. // The pusher:member_removed is triggered when a user leaves a channel. We decrease the number of players by one and also set the secondplayer boolean to false. // This function receives new data from Pusher and updates the exisiting scores. This is what updates each player's score in realtime. This function simply generates random alphanumeric characters and adds a prefix of id= to the result. This function checks the address bar of the browser for URL parameters, in this case, any parameter that starts with ?id= prefix and then returns the alphanumeric character at the end of the prefix. For example, this URL https://hamilton-lyrics.firebaseapp.com/#/?id=agbew0gz will return agbew0gz. This function is used to check if the answer chosen is correct or incorrect. If the chosen answer is correct, 10 points will be added to the current score and if the answer is incorrect, 10 points will be deducted. The score is also sent to other subscribers of the channel via the channel.trigger() function. At the end of it all, a new question is gotten via the getNewQuestion() function. This function is used to select questions randomly from the lyrics array that holds the various questions. It takes in two arguments, array and count. array would be the array we are trying to pick a random item from (lyrics) and count is the number of item to be chosen (1 item). This function is called in the getNewQuestion() function below. This function is used to get a new question for the game. It utilizes the getRandomQuestions() to get a new random question and sets it to the question variable. It also uses the question’s data in the question variable to initialize the various data instances. We are done with the functions. Let’s create the template tag and write the HTML code that will display the view for the game. In the code above, we enclose everything in a transition tag with an attribute of fade. There are two div sections that display conditionally. The div tag with a class of home is shown when there’s just one player online and the div tag with a class of play is only shown when two players are online. At the end of it all, your Home.vue file should look like this. Now that our application is ready and working well, let’s deploy the application using Firebase Hosting. 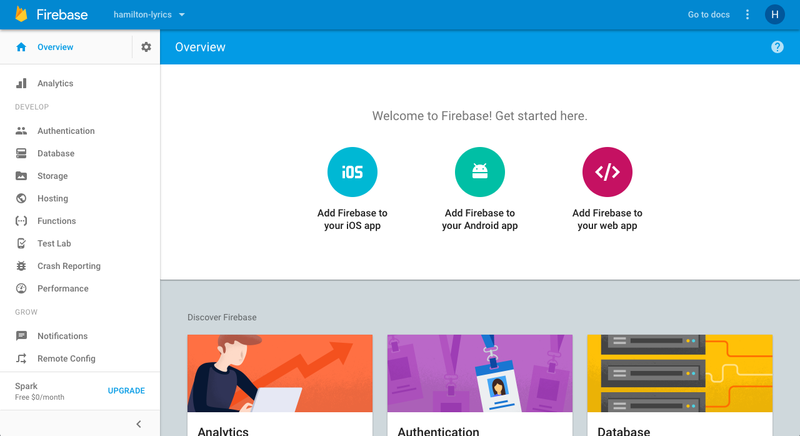 Getting started with Firebase Hosting is straightforward. Go over to console.firebase.google.com and create a new account or sign in if you already have an account. Your dashboard should look like this (if you’re a new user). Let’s add a new project by clicking on the Add Project button. That opens up a modal box that asks you to give your project a name and also choose your region. Once that’s done, you should be redirected to the project’s dashboard which looks like this. The dashboard menu on the left shows all the Firebase services you can use in your application. Before we start deploying apps with Firebase Hosting, we need to install the Firebase CLI using npm. If you've previously installed Firebase command line tools, run the install command again to make sure you have the latest version. Once the Firebase CLI has been successfully installed, we can deploy apps to Firebase Hosting with a single command. Next step is to sign in to Google from the terminal so Firebase knows which account to use. Run the command firebase login in your terminal. This process takes you to a login page in a browser where you enter your Google credentials and you are then logged in. Now Firebase is installed on our computer and we can begin deployment. Now that we are done with the development of the app, it’s time to deploy the application to production via Firebase Hosting. How exactly do we do that? First of all, we need to build the Vue.js app for production and then run the Firebase deploy command. Let’s get started on that by running the command below. The command above helps to minify JS, HTML, and CSS. All static assets are also compiled with version hashes for efficient long-term caching, and a production index.html is auto-generated with proper URLs to these generated assets. Once the command is done with its process, the production-ready app can be found in the dist folder. That is where the firebase deploy command will be used. You’ll be prompted to choose which of the Firebase CLI feature you want to use, choose Hosting. You’ll be prompted to associate the current project directory with a Firebase project. 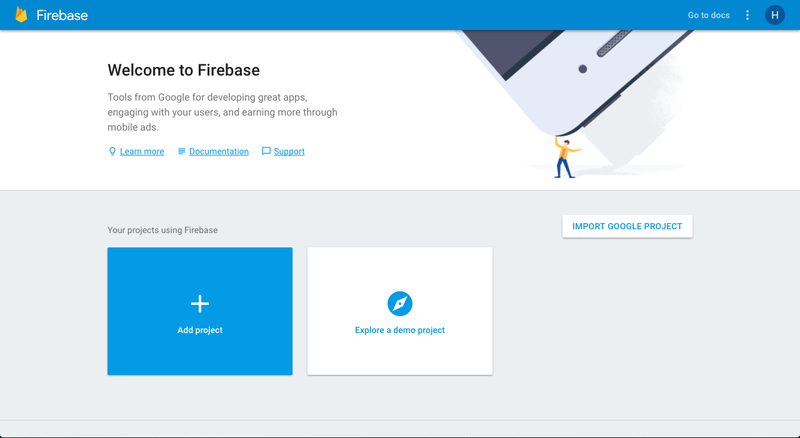 Choose a Firebase project or create a new one. You’ll be prompted to type in the name of the folder you want to use as a public directory. This public directory is the folder (relative to your project directory) that will contain Hosting assets to be uploaded with firebase deploy. In this case, the name of the folder is dist. You’ll be prompted to choose whether to configure the project as a single-page app. Choose Y. The initialization process should be completed and we can run the firebase deploy command now. When the deploy process is done, a live URL will be generated automatically by Firebase, in this case, hamilton-lyrics.firebaseapp.com. Firebase allows you to connect a domain to your Hosting instance so you can use a custom domain for your applications. In this tutorial, we learnt how to deploy static pages to Firebase Hosting and making it realtime by using Pusher. We saw how to implement Pusher’s Presence Channels by using it to identify two different users online and then using it to build a multiplayer game. We also learnt how Client Events work, how to trigger events from the client side as opposed to triggering from a backend server. Firebase offers a slew of services that can help you to build apps faster and you can read about them on the Firebase site. If you want to go through the source code for the game above, you can do that on Github. You can also see the live demo at hamilton-lyrics.firebaseapp.com.